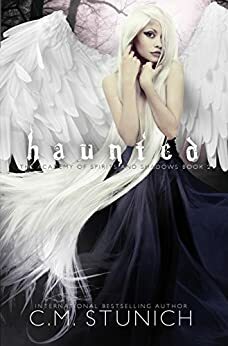 The second book in the Academy of Spirits and Shadows, Haunted by C.M. Stunich. After the events of the previous book, so much has changed for Brynn. Talon has been taken by the wolves and the queen won’t allow anyone to deal with the issue. On top of that Dyre and his brother are having issues. Without Dyre to be connected to Trubble, Trubble has the chance of going completely shadow and losing himself. Vexer has been helping out Brynn and knows that he wants her for his mate. While he is more of a monogamous type, he understands that Brynn has feelings for Air and Eli. Brynn starts to work on the spell to try to get Air, Eli, Cross, and Dyre back into their bodies. The spell has to be perfect or there is a chance that the guys will never get to come back. So much happens in this that the best option is to just read it I swear. This is a great second book. So many things are going on in this book, but never once did I get lost while reading. I like the characters and it’s obvious that Brynn is growing up and even getting a hang of herself (she has a habit of crashing into things, I always say a happen waiting to accident). The writing is well done and thought out. I have really enjoyed this series so far. It is a reverse harem and each of the chapters are writing from each of the characters points of view. The addition of the chapters from Trubble might be my favorite. I really like him a lot especially with everything that he says. Each of the characters are so in depth that I am looking forward to the next book. Read Spirited here and check out my review here.